One of the most rewarding ways to practice Ho'oponopono is through caring for our own Inner Child -- our subconscious, or Unihipili. Dr. Ihealakala Hew Len teaches that our relationship with our Inner Child is the most important relationship in all creation. After all, our Inner Child not only runs our body, but also stores all memories that have accumulated in us through time (including unconscious ones). When cared for, this Inner Child is a source of creativity and delight; when ignored, its pain shows up in myriad ways. Many of us forget that such a part even lives inside us. We're adults who drive ourselves mercilessly with work, responsibilities, and schedules; when mistakes happen, we lacerate ourselves with self-criticism. We rarely celebrate our accomplishments, instead racing to the next thing on our "to do" list. No wonder we end up with insomnia, backaches, muscle pain, indigestion, irritability, depression, anxiety, and fatigue! No wonder so many of us have resentment just beneath the surface of our smiles. Our Inner Child registers all this mistreatment and neglect, expressing its suffering in symptoms. What would happen if, instead, we took the time to gently get to know this child? What if we looked after it, making sure it's regularly loved and nourished? What if we explained to it the plans for each day, making sure our Inner Child is willing to come along? Sometimes our Inner Child can warns us when plans need to change. Also, what if we prepared a little bag each day with things it might need -- healthy snacks, or other comforts? We as adults, or Mothers (Conscious Mind, or Uhane) can do these things -- and can lovingly show the Child how to release or let go of painful memories. Mindfulness or Vipassana meditation has a body scan, focusing on each part. We breathe into any part that feels discomfort. Ho'oponopono has similar in caring for the Child -- and when we notice a pain, we can realize that this is a memory being held. We can ask our Inner Child to please let go. In this way the Child learns to clean moment-by-moment, as problems arise. With love and care, it can become a willing companion in clearing out these old memories. And it's needed, because it's only through our Inner Child that we connect with Divinity -- the ultimate source of transmutation. I found a little photo (above) from long ago, which shows how the Child responds to gentle care and concern. 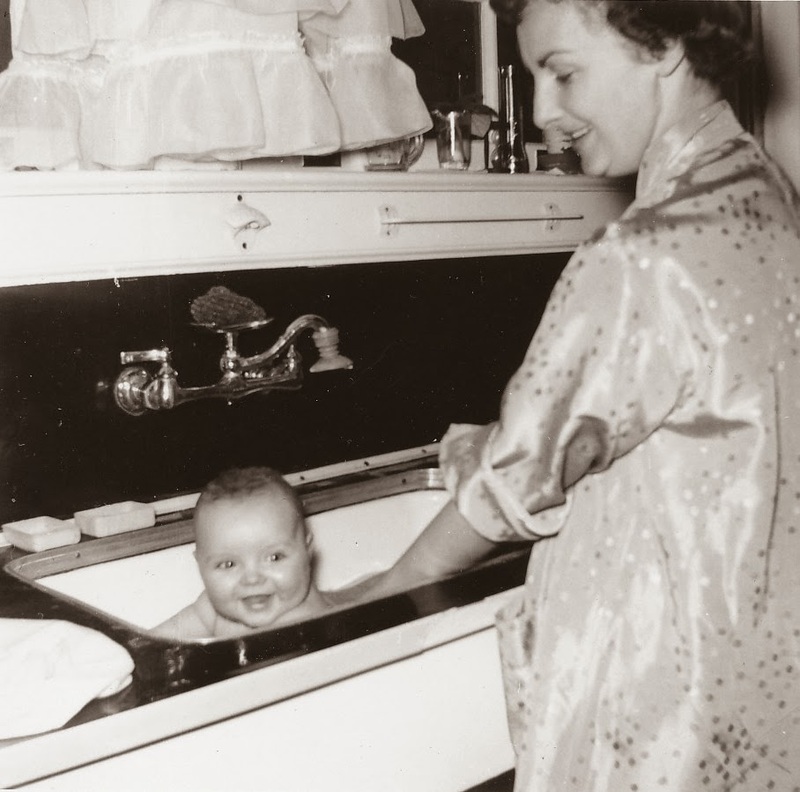 In it I'm only 6 months old, and my mother is bathing me in my grandmother's kitchen sink. I've washed many dishes in that sink -- yet totally forgot that at one time, I fit in there too. How wonderful to remember, to let go, and to forgive. I've recently returned from a week-long, silent Vipassana (Insight Meditation) retreat. Called "Convergence" and run by teachers and staff from Spirit Rock Meditation Center, it was held at the Angela Center near Santa Rosa, CA. The "convergence" they spoke of was bringing Mindfulness-Based Stress Reduction (MBSR) together with the Buddha's teachings in vipassana tradition. This usually doesn't happen so openly in MBSR courses, even though many teachers have personal experience with Buddhist practice. At its heart, Insight Meditation is the practice of mindful awareness in any moment. You can use anything -- breath, body sensations, emotions, sounds, etc. -- as foci of attention. This tradition recognizes that the mind's productions are often comical and obsessive -- even sometimes tragic because they distract us from current experience. It encourages us to notice these thoughts and reactions, but not grab onto any of them. After all, they are not reality. When our present-moment awareness lapses, we can always come back to the breath -- hundreds of times in a single 45-minute "sit," for some of us! Ho'oponopono sees our thoughts as simply "data" or "memories," which are laden on top of what we truly are. They are internal programs which run on their own. We can't help having them, yet we are responsible for them. They can also absorb our attention and run us, if we let them. We can choose instead to "clean" with these memories -- letting them go, and asking Divinity to transmute them into pure light. There's a simple process for doing this, which we can use in every moment. It's what Dr. Ihaleakala Hew Len and many other wonderful Ho'oponopono teachers with IZI, LLC teach at Ho'oponopono seminars. During the "Noble Silence" held at the retreat, I was able to clean with Ho'oponopono as much as humanly possible for me. Normal conversation, after all, was eliminated. Of course, there was plenty of inner conversation needing to be released! I'm not running out of memories to clean anytime soon -- yet I did experience some times of exquisite inner quietness and peace. 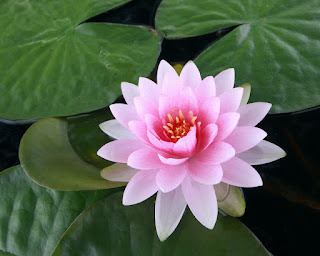 Ho'oponopono and mindfulness tradition share certain qualities, including the gentle compassion held towards the body. Ho'oponopono tradition holds that our bodies are like our inner child, and need care and concern. They hold eons of memories and data, which may show up as physical pains, illness, and overall suffering. In mindfulness meditation there are "body scans," where you gently and without judgment review whatever experiences are present in your body. It's like asking your Unihipili (Hawaiian Inner Child part) to tell you what it's feeling -- resulting in a more tender connection as you listen and observe. Since our relationship with our Inner Child is the most important relationship we can ever have, nurturing this through a body scan or mindful yoga feels just right to me. I love both traditions for their humility, and their care for all living things. The Lovingkindness meditations found in vipassana are somewhat similar in feeling to the generosity and lovingness of "aloha spirit." Dr. Hew Len once told me that Aloha means "in the presence and breath of God." Greeting each other this way is acknowledging the Divinity in both of us. In endowing all things with a 3-part identity, Ho'oponopono shows reverence for the entire planet -- down to the tiniest being. As I moved about the Angela Center's grounds on my walking meditations, there were roses, honeysuckle, redwoods, kitties, lotuses, irises, rhododendrons, and lovely grass to enjoy. In the buildings I could clean with walls, chairs, water, doors, and beds. The practices of vipassana and Ho'oponopono are universal, and join people together in love for all things. With love and gratitude to Morrnah Simeona, Dr. Ihaleakala Hew Len, Kamailelauli’I Rafaelovich, and all who have shown me the ways of Ho'oponopono. I carry these traditions wherever I go. They have become my way of life. Happy New Year, everyone -- especially on this day marking both Martin Luther King's birthday and President Barack Obama's second inauguration. For me, it's a day of both freedom and peace. Maybe all days can have those qualities, if we look carefully. Still, this one feels special to me somehow. Some of you may have heard about the several nights of below-freezing weather we recently had in the Phoenix area. I know many of you live where there's snow on the ground -- but central Arizona is not that place. We're in the desert, with saguaro cacti and wildflowers galore. January is usually when others want to visit us -- golf tournaments, horse shows, fancy car auctions -- all in the Valley of the Sun. Once the weather predictions came through, people were frantic to protect their plants and outside water pipes. Nurseries ran out of garden cloth. Those of us who were slow to alert had to rely on our wits. The neighborhood became a cacophany of bed sheets, light blankets, and anything our imaginations could muster. One home's saguaro sported what looked like long red underwear -- on its top! I rounded up every light fluffy covering I could find, tucked everybody in, and hoped for the best. It was 5 nights in a row of high 20's -- brrrr! The days were a little better, in the 40's. Plumbers were busy all over the Valley, repairing frozen, burst water pipes. And in my yard, those plants coverings didn't come off until this morning. I had been worried about the little rose bush I planted last year -- it's called "Our Lady of Guadalupe." Those of you who've attended a Ho'oponopono training know that "Our Lady of Guadalupe" is also the Identity (or Patron Saint) of Mexico. So it was perfect that it grow in my yard -- blending both the spirit of a nearby country with my love of Ho'oponopono, in a way. The plant's roses are a gentle pink with soft, sweet fragrance. I have loved roses since childhood, when they grew beneath my window. So now it was time to see what had happened to it -- in my yard where other things had died in the freeze. Anxiously, I lifted the rose bush's covering . . . . and the above photo shows what was beneath. Such a beautiful, welcome surprise! How those delicate flowers survived their temporarily arctic environment, I'll never know. I have to tell you also, they're an answer to a prayer. Even when we do our Ho'oponopono cleaning, we can forget that Divinity (or God, Spirit, Creator, or whatever other name you might want to use) is really with us, and has not forgotten us. I have difficulty with that from time to time. When not fully myself, I unconsciously feel that Divinity only cares for other people, and has left me here to struggle however I can. As Dr. Ihaleakala Hew Len teaches though, when we do our part (the cleaning) Divinity does Its part (the forgiveness and transmutation of data). It can be no other way. So when my heart was in winter, I lifted the blanket and found sweet spring. It was needed and welcome. Our Lady of Guadalupe is a lady of peace. In the accompanying legend, the Virgin first appeared to an Indian commoner named Juan Diego -- and spoke to him in Nahuatl, his native language. She asked him to tell the archbishop that she wanted a church built in her honor. He tried twice and failed. And then she produced a miracle. She bade Juan Diego pick roses in a sterile spot where normally only desert plants could grow. Then she gathered the roses into the Indian's cloak, and told him to present both cloak and roses to the incredulous archbishop. When Juan Diego unfolded his cloak before the bishop, the image of the Virgin was miraculously stamped upon it. The bishop acknowledged the miracle, and ordered a shrine built where Mary had appeared to her humble servant. The spot is now a well-visited basilica. My roses are not as grand as a basilica . . . but they're a reminder of the aloha present all around us and in us, when we're our true selves. Thank you Dr. Hew Len, for your wisdom, teaching, and laughter. Thank you also to Divinity, for my own little miracle in the desert today.